The year 2018 started in a high spirit for aspiring African entrepreneurs as the Tony Elumelu Foundation announced its entrepreneurship programme for the continent’s creative minds. 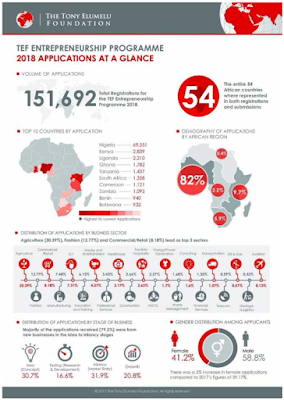 An initiative to empower 10,000 African entrepreneurs within 10 years, the Tony Elumelu Foundation Entrepreneurship Programme – TEEP – opened for application on 1st January through 1st March 2018. Over 150,000 Africans- 58.8% males, 41.2% female – submitted their applications to compete for a spot in the top 1,000 business ideas. Today, Thursday 23rd March 2018, the 1,000 inaugural winners for TEEP2018 will be announced in Lagos. And the 1,000 successful candidates will be posted on www.tonyelumelufoundation.org/TEEP website. If you missed the opportunity to submit your application, or don’t make the TEEP 1,000 this year, you may still apply for the TEEP2019. The Opportunity is open to all citizens (18 and above) and legal residents of all 54 African countries with businesses that operate in Africa. Download list of 2018 Tony Elumelu Entrepreneurs winners.